General Orchestrator : we developed a General Orchestrator allowing the robot to coordinate its capacities (navigation, perception, interaction) and make decision on defined scenario. Navigation Manager : this functionality provide a set of navigation strategy depending on the observed context. Regarding to the context (lots of people, complex environment, large free space zone), the robot changes it way of navigation. Face recognition : a solution was developed to automatically catch face and learn it for future detection. 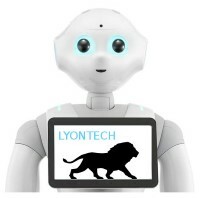 “LyonTech” team : 5th place at Robocup@home SSPL Montreal, CANADA, 2018 LyonTech is composed by former members of CPE Lyon team and by former candidates for Robocup organization. Lyon city and INSA candidated for the organization of the Robocup, in 2016 (co-led by Olivier Simonin from Chroma/CITI team). He is TC Robocup@home for 2017-2018. He is the Organizer of a French @home open (first edition 24, 25th January 2018 in Lyon). He was OC for Robocup@home SSPL in Nagoya and Montreal and OC for Robocup@home LARC in Recife.